Six Marines of 3rd Platoon of Company E, 2nd Battalion, 28th Marine Regiment, 5th Marine Division, part of a patrol commanded by 1st Lieutenant Harold George Schrier (October 17, 1916 - June 3, 1971) pass the flag to one another as they climb Mount Suribachi. Included are two men carrying flamethrower backpacks. One of those two men is Corporal Charles W. Lindberg (June 26, 1920 - June 24, 2007). 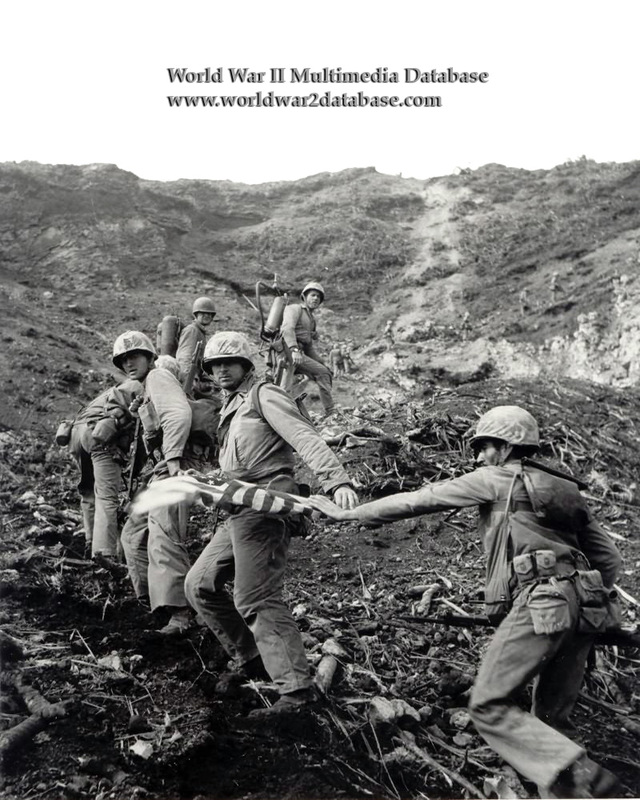 The 54 x 28 inch flag, obtained from attack transport USS Missoula (APA-211) was raised on a 20-foot section of pipe at 1020 Hours above Iwo Jima's highest landmark.